Combat actions other than the standard, damage dealing attack can be resolved in many different ways. 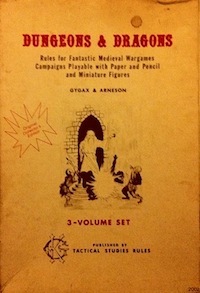 In the past, I have used several approaches, such as requiring ability checks instead of or along with attack rolls, or using ability score contests similar to the opposed skill rolls suggested by D&D 4E. However, recently I have come to think that using ability scores in this area is not the best approach. It requires generating ability scores for monsters regularly, which granted is not that cumbersome, but is nonetheless suboptimal. Further, it plays oddly with the primary measure of combat skill, which is the attack bonus (or combat tables), which seem better suited to resolving most kinds of nonstandard attacks. The system below is from The Final Castle rules, but works just as well with most traditional fantasy games, whether or not monological combat is being used. All physical actions that might be taken in combat are handled with a combat roll. By default, this is the standard “roll high, hit a target number, do damage” that should be commonly recognizable. However, rather than inflicting damage, a character may attempt to cause any number of other reasonable effects, taking the effect rather than damage, as long as the intent is declared prior to the roll and is fictionally reasonable. I have predefined a number of common maneuvers which can be substituted for a standard attack, such as disarm, grapple, and disengage, but these are intended to be samples rather than a comprehensive list of moves. Undefined maneuvers should be negotiated between players and referees prior to any action declaration. Additionally, I have a rule called overkill which says that attacks do +1d6 damage if the combat roll exceeds the target number by four or more. This is another way that the fighter’s increasing attack competency with level scales damage up, but it also applies to maneuvers. That is, if a combatant is attempting something like a push-back bull rush maneuver, if they succeed with overkill, the result is both the desired effect and 1d6 damage. Thus, doing an attack/maneuver at once is possible, but more difficult, and you might get just the effect without direct damage. As a more extended example, consider the standard grapple attempt. If it is fictionally reasonable for a combatant to attempt a grapple (and note this is no more unambiguous than whether or not a standard damage-causing attack is fictionally reasonable), the grappling agressor makes a combat roll. On success, the target is successfully grappled, and can no longer move, though may be able to perform close attacks. That now-grappled target will need to attempt an escape maneuver to be free of the grapple, if that is desired, which will require a dedicated future action. Further, in this case, any appropriate side effects of a grapple automatically trigger, such as armor spikes or flaming body dealing damage. Were the initial grapple combat roll to achieve overkill, damage would also be dealt on the first round. Since the resolution system uses the combat roll, fighters are better at maneuvers than other characters, but maneuvers are not limited to fighters. Like thief skills, I prefer for creative actions to be available to all characters, rather than being limited to fighters for niche protection. The trade-off is clear: give up damage in return for an effect. And the system is trivial to remember, in all cases: make a combat roll. In general, I think this maneuver system can be used for many actions that might be considered stunts in other systems. Particularly tricky maneuvers could either be done with a penalty such as 5E-style disadvantage, or require an overkill result to get the basic effect (note that this naturally reduces then to the 2E standard of called shots being at -4, which seems like a nice result). In The Final Castle, armor reduces damage and the target number represents a more abstract enemy threat level (as was planned for Gravity Sinister). This means that there may be advantages to grappling, or engaging with some other nonstandard maneuver, a heavily armored foe, as the damage reduction will be less likely to come into play. This is a difference from D&D, which would make the trade-off dynamic slightly different if AC is used directly as the target number in all cases, but is in any case easy to adjust for using a basic penalty or advantage/disadvantage scheme. This entry was posted in Rules and tagged combat, The Final Castle on July 14, 2014 by Necropraxis.